Our recently opened campsite, Kemp Děčín is trying to fulfill all ideas about quality accommodation especially for bike tourism on the newly opened Elbe Cycle Route. It also offers a comfortable stay for in-line skating and water sports enthusiasts, climbers, bikers, traveled tourists, caravan owners and all other fans of an active lifestyle. The bungalows and tourist accommodations are simply equipped: bunk beds, table and chairs as well as refrigerator and hot air blower for cold days. Washing and shower possible, toilets are available in the social building and the sanitary container. Your caravan can be also left on the stand during the winter months, as there will be daily security checks. Our location is opened from 30th March until 31st October opened. Small family place in the national park " Saxon Switzerland". Perfect starting point for bike and climbing tours in the Elbe Sandstone Mountains. We have modern sanitary facilities, BBQ-und campfire as well as a playground. One room with sink and cooking possibility, washing machine, dryer are also present. Parking lots for caravans are partly parcelled on terraces, tents stand on a fruit meadow. Several separate units of approx. 100 sqm large and terraced comfort stands with electric hook-ups for 7 caravans. 6 camping tents can be set on the meadow. Modern equipped sanitary building (single baths with shower, WC and washing place) and a summer kitchen are present. You can use our recreation room on request. 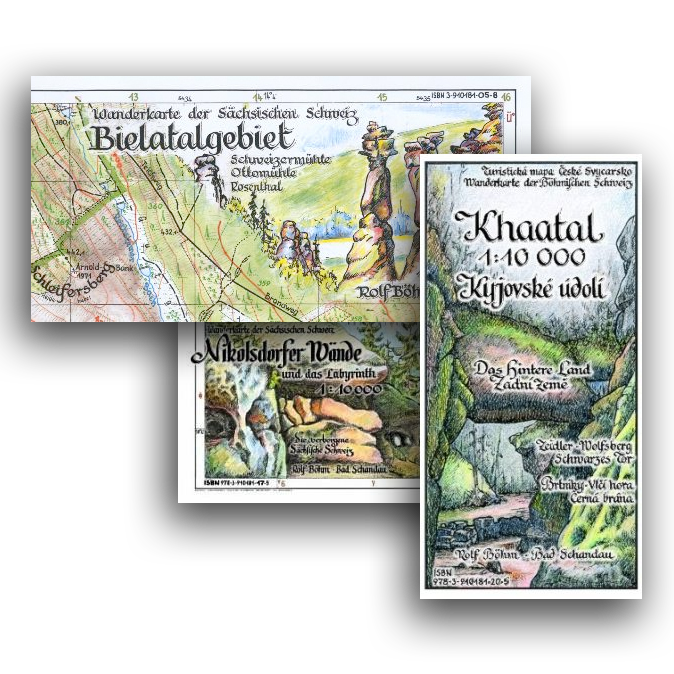 With the high-resolution, hand-drawn trail maps you are prepared for hikes. With a scale of 1: 10000 the entire Bohemian-Saxon Switzerland is recognized with a number of individual cards.